07/10/2009 - We had a really early start as we had to get a 'chicken bus' as the locals call it, to Ayutthaya. Louisa didnt feel very well in the morning but managed not to be sick on the bus. It was really cramped on the bus and we can understand now why its called a chicken bus!! 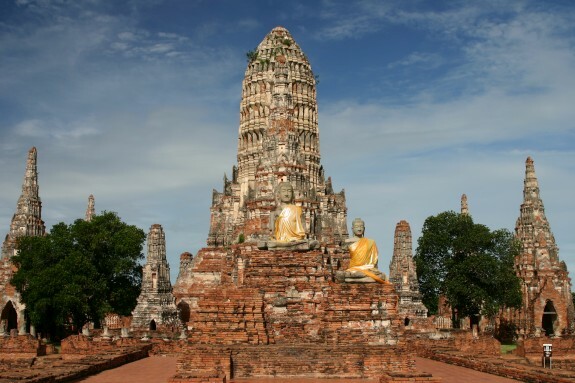 Ayutthaya used to be the capital of Thailand and its is a very old city. We got a tuk tuk to the temple you can see in the picture called Wat Phra Si Samphet, but they took us to the wrong place and we ended up at an elephant centre. We found the temple in the end and had a walk around, then went back to the hotel for a swim as we were hot and tired from the 4 hour journey on the bus. Then we got on the sleeper train to Chiang Mai which would arrive at about 8am. We were both suprised by how decent the train actually was, we were expecting wooden seats and grumpy old thai people looking at us the whole journey. But the seats were comfy and the beds looked very impressive until i had to climb up onto the top bunk. It was tiny and i felt like i was going to fall so i didnt have a very good sleep. I let louisa sleep on the bottom which was much bigger so she got a better nights sleep than me!